Implant Structures (Main Characteristics) | GIKEN LTD. Traditional “Gravity Structures” can be constructed by using general construction materials i.e. soil and concrete, and simple techniques i.e. soil excavation and backfilling. However, gravity structures require a large footprint and complex construction sequences. 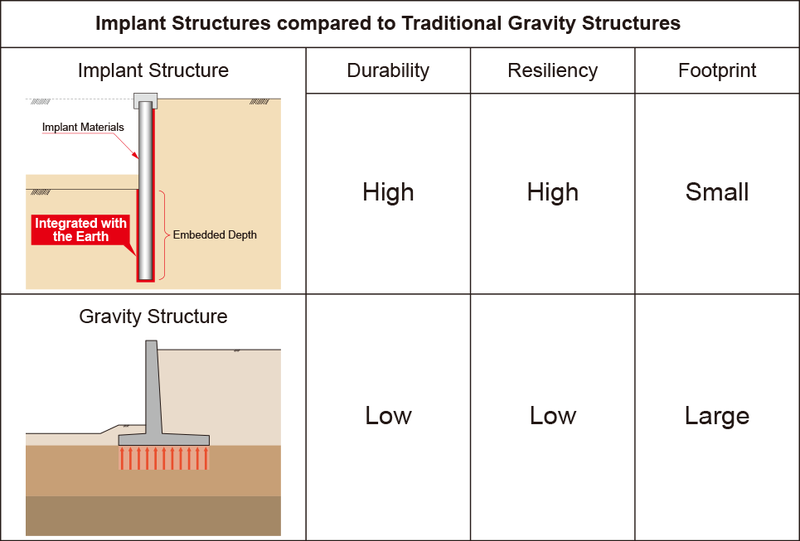 This lead to a difficulty in removing or upgrading the structure and therefore, gravity structures are normally constructed based on the “Scrap & Build Concept “. On the other hand, with the “Implant Structures”, high yield materials are directly embedded into the ground with a minimal footprint and construction sequence. Thus, the Implant Structure can easily be removed, deepened and strengthened during its design life, based on the “Reusable and Upgradable Design Concept”. The difference in structural strength is obvious! This animation simply shows the difference between Implant Structures and gravity structures. This video compares the resilience of Implant Structures to gravity structures against tsunamis. The models for the test are an Implant Structure (tubular pile wall) and a gravity structure (concrete caissons) on a scale of 1/33. This apparatus can simulate the maximum wave-height of 6m and wave velocity between 10-15m per second. 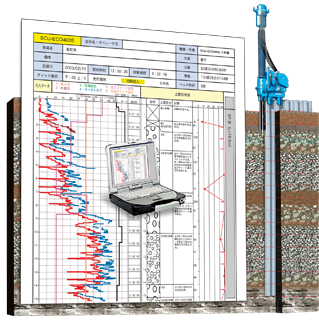 PPT ( Pile Penetration Testing ) Thorough pile monitoring method ensures a total observational construction process. With the Press-in Monitoring System, real-time data logging of the Press-in operation is available during each pile installation. These are Press-in Force, Extraction Force, Auger Torque, Chuck Rotation Torque, Elapsed Time etc. Then, this monitoring data can be correlated with the D.V.L. (Design Verification Load). Based on the correlation, it is ensured that the bearing capacity of each pile exceeds the D.V.L. This thorough pile monitoring approach is called PPT (Pile Penetration Testing), which guarantees a total observational construction processe.